The quiet trading session on Monday weakened NZD and today New Zealand is publishing Global Dairy Trade Price Index and the US will release Balance of Trade. 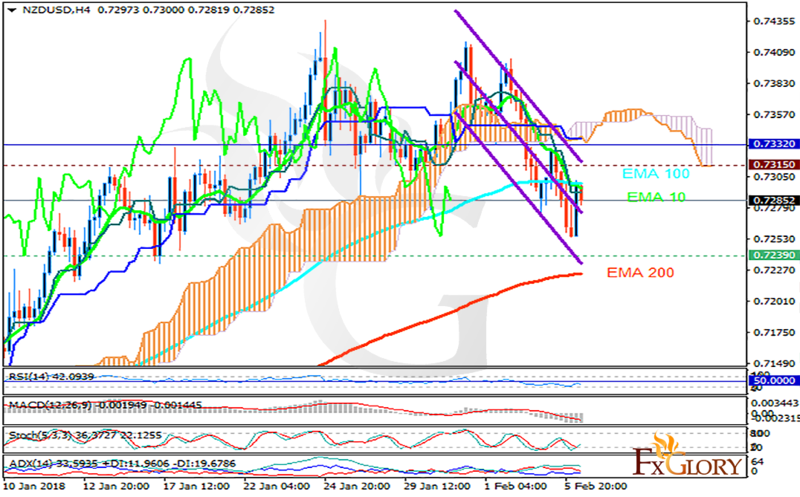 The support rests in 0.72390 with resistance at 0.73150 which both lines are below the weekly pivot point at 0.73320. The EMA of 10 is moving with bearish bias in the descendant channel and it is below the EMA of 100 but above the EMA of 200. The RSI is falling towards the oversold area, the MACD indicator is in negative territory and the Stochastic is showing upward momentum. The ADX is showing buy signals. The price is below the Ichimoku Cloud and the Chinkou Span. The Tenkan-sen and the Kijun-sen are both showing a horizontal trend. Short positions are recommended towards 0.718.